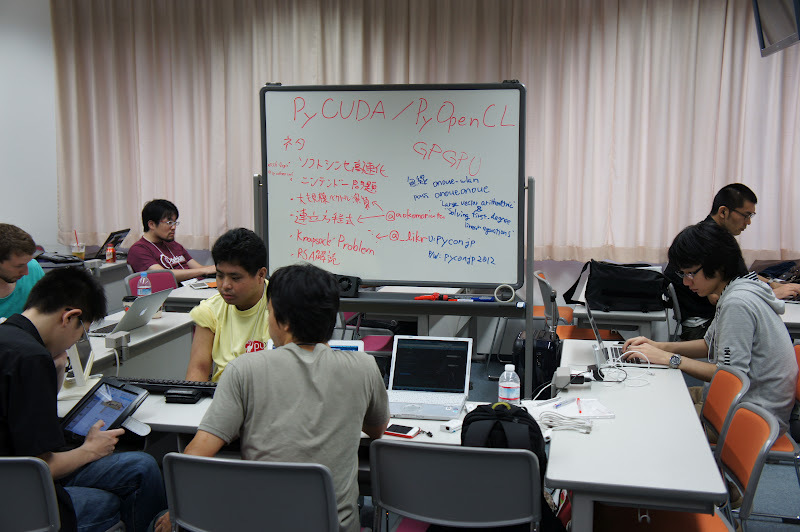 Development sprints are a key part of PyCon JP, a chance for the contributors to open-source projects to get together face-to-face for up to four days of intensive learning, development and camaraderie. Newbies sit with gurus, go out for lunch and dinner together, and have a great time while advancing their project. PyCon JP Development Sprints are one day of intensive learning and development on an open source project of your choice, in a team environment. It’s a time to come together with colleagues, old and new, to share what you’ve learned and apply it to an open source project. In the crucible of a sprint room, teaming with both focus and humor, it’s a time to test, fix bugs, add new features, and improve documentation. And it’s a time to network, make friends, and build relationships that go beyond the conference. PyCon provides the space and infrastructure (network, power, tables & chairs); you bring your skills, humanity, and brainpower (oh! and don’t forget your computer). All experience levels are welcome; sprints are a great opportunity to get connected with, and start contributing to your favorite Python project. Participation for Sprint is free! Please just bring your laptop for development. There will be Wifi available. To join Sprint, please sign up from the Connpass site http://connpass.com/event/3403/ . If you would like to propose your own theme, you can register as a Sprint Leader. You may also register as a Sprint Attendee to join themes proposed by other Leaders. Here is the list of sprints registered so far. Please join us if anything interesting! 1.2 development, translation of Sphinx documentations, or anything exciting to do with Sphinx! Let’s fix of Mercurial related products. Let’s do something with MyHDL (HDL on Python). Welcome anyone who is interested in FPGA. It is up to us how we want to run this session, and I suppose this will be something more like tutorials because, including myself, not many have worked on this area. Please arrange on your own if you are bringing FPGA, etc. A: Sprint is a short and intensive software development event. Developers get together for a theme and develop software. Q: What do I do there? A: It is completely up to you. You can work on your own development project or join other people’s session. You may network with people by getting involved with multiple sessions and discussions. Q: I am not joining conference. Can I join Sprint? Q: I am a beginner programmer. Am I eligible to join? A: Yes! Should you still have the concern, you may join the tutorial sessions scheduled a day before PyCon APAC 2013 conference. You can find the details on チュートリアル page. The tutorial session will be provided only in Japanese. Q: Who can be Sprint Leader? A: No requirements, and everybody is welcomed to become one. Motivation to become a Sprint Leader would be, for instance, to work with other Pythonistas on the topic you are interested in, to energize Python community, to network with other developers, etc. Q: Can I join multiple sessions? A: Please talk to Sprint Leader if you are interested in more than one theme. Q: Can I bring in foods and drinks to room? A: Yes, but please ensure that you keep it clean at your own responsibility. Q: Can I join or leave in the middle of session? A: Yes, and there is no plan to have registration for Sprint.